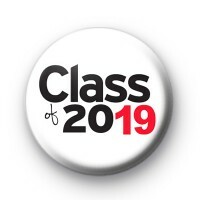 White Class Of 2019 badge for graduation with black and red text which reads Class of 2019. This badge is perfect for teachers & lecturers to give out to their students & perfect for both university graduation and school leavers. We sell a lot of these Class of 2019 badges to schools & universities. Standard 25mm button badge made by hand in our UK workshop.